It’s a touchy subject – Should you do it or not! I took the plunge and I’m pretty pleased with the outcome…. 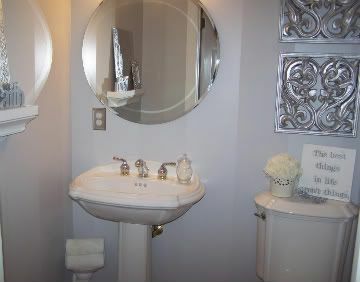 This is what our powder room looked liked when we moved in. After a few months of bearing it, I broke down and could no longer handle being strangled by the paisley flowered print in such a tiny space any longer. My first thought, tear it off, I want it gone! How hard could it be? I turned to my trusty friend Google, seriously how could he let me down…well he did. Every story I read seamed like a horror story not to mention a long drawn out process, and I am the queen of impatience, remember. The major concern was how the wallpaper was originally put up which I had no clue because I obviously did not do it. If the walls were not primed or painted prior to the wallpaper application it could turn out to be a messy disaster. You could literally tear down your walls trying to remove the paper itself, which was not what I wanted to hear. I was frightened by the thought of having to replace the drywall with so many other projects going on. The powder room was very functional as is; it was the sight of it that I could not get past. I just wanted a quick fix to cover up these fields of blooms. So why not paint? It works on everything else, we all know this! Once again, I turned to my questionable trusty friend Google only to be left out in the rain for a second time. Every story I read…well just not a good idea ~ they all highly suggested to go back to option one ~ tearing down the paper and starting from scratch. Still I was determined to find a quick fix and headed to the men in orange aprons. Well they laughed and I left. I knew I could do this. The more people say ‘no’, ‘don’t’, actually gives me the motivation to prove them wrong. I came home and took all the information I had learned and came up with a game plan.The wall paper was in really good shape, no torn seams or peeling. I started by wiping down everything really well. I knew it had to be sealed it extremely well before applying the paint so I turned to Kilz Oil-Based Primer & Sealer. It’s important to use an oil based product for this base coat. Boy is this stuff strong! Two coats later and a job well done ~ it left me with a clean blank slate. Only problem (the one I was most warned about) was that you could still see the seams where the wall paper was overlapped. No problem, as with a little creativity, I had a solution. Stripes! They have seams too, right! Why not make vertical stripes, alternating flat and satin paint, measured out to match the seams already in place. ~Enter handy man hubby for the hard daunting job of marking the layout~ my knight in shining armor! With paint tape in place I was ready to prove them all wrong! Well, at least at this point if it didn’t work out I had at least accomplished my main mission of making the overpowering paisley print go bye-bye! This is what we were left with…. You can not even tell there was even wallpaper up. Friends and family who had seen the bathroom prior to the makeover think we tore it out. We used the same shade for both stripes, one in a flat finish and the other in satin. The color is called Gentle Rain by Behr. 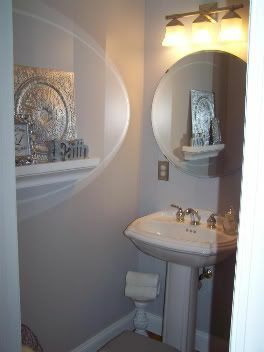 We added a simple round beveled edge mirror and a three-light brushed nickel vanity light. The brass towel bar was replaced with a white picture shelf. I have found that towel bars just do not work so well in our powder rooms! 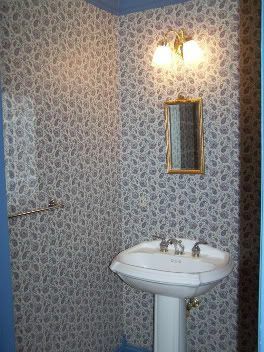 In our last house, over time, the wall in which the hand towels were located looked horrible from people washing their hands and dripping water as they dried off. I vowed to change that here and never even put one up. When we are expecting company I drape hand towels over the side of the sink. 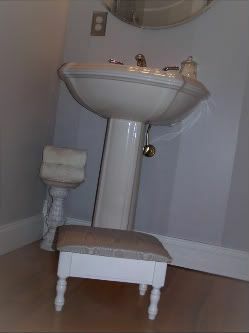 …and my footstool make over. 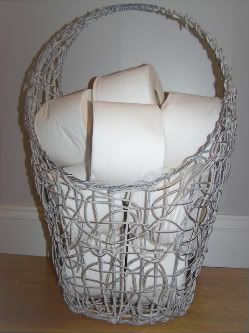 Got to have lots of tp for visiting guests…plus I needed something to fill this lovely basket! I’m glad you decided to paint! It looks SO much better and I love the color you chose. Very serene palette. Good job! I love what you’ve done with the walls. And really LOVE those hangings over the toilet. Where did you get those? You told where other things came from, but not those. 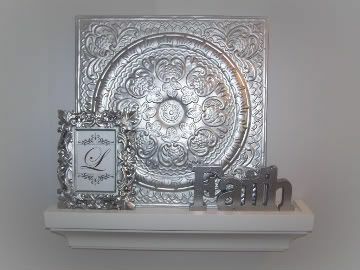 They add so much elegance to your powder room. I adore them. Congratulations – a job well done. WOW!!!! It looks absolutely Amazing!!! !Hey girlie, dead on over to my blog for a chance to win one of those decals I featured the other day! I don’t blame you! That was some UGLY wallpaper. And I’m sure it will be fine, it’s a powder room so it won’t be under steam from a shower. I love the outcome! The toilet paper basket is very cute! Thanks for sharing! It is beautiful! Sometimes you just have to do that! 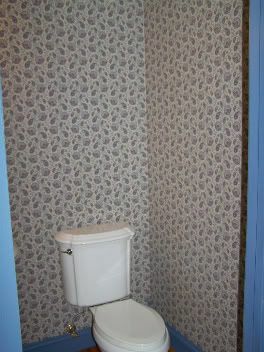 My mom did the same thing a while ago in her old house and you couldn’t even tell that there had ever been wallpaper there! Great job on your bathroom. It looks like a totally different space! Pat yourself on the back for this one! Thanks for stopping by my blog, I always enjoy meeting new people and reading new blogs. Thanks for playing along with Toot Your Horn Tuesday! Can’t wait to see what else you’ve got up your sleeve. Hey Stephanie Lynn. You’re bathroom looks fantastic! I really love it. I bet you’re ready to live in that room and still ewing and awing over the transformation after that old wallpaper. LOL. The crown molding is great. I always think it adds so much to a room. Your decorating is awesome! Can you tell I love it and you saved yourself so much trouble by just painting the wallpaper. Wonderful make over. The bathroom really looks great. Just wondering if you have received the package yet? 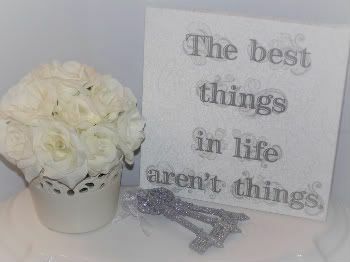 ~Deborah~ The wall hangings were purchased about five years ago from TJMaxx/Marshalls. They were originally gold but got a much needed coat of Satin Nickel and Metallic Silver. I found your blog from “The DIY Show Off” and am now a follower! I love this bathroom redo! I just put a coat of primer on the wallpaper above our fireplace. I didn’t use oil based but some heavy duty stuff we had kicking around. We’re planning on selling our house soon so I really just want it to look nice – with a big picture up there I’m sure you won’t see the seams. We had a powder room even worse than that but luckily the paper was peeling off very easily so it took nothing to take down. But it still took me 2 years and the decision to move to actually do it. Just found your blog – lots of great ideas. Thats amazing! Great job at going ahead and doing it even though everyone told you not to! Nice work! I’ve enjoyed looking through your blog and have you bookmarked. I did something similar in our old kitchen– for updating to sell. There were some obvious seams, so I just floated some drywall mud sparingly to cover the seams. After a good sanding, priming, and painting you couldn’t see any of the seams if you tried. 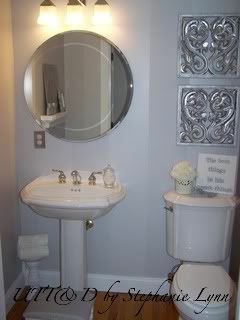 Truly beautiful, I love the vintage feel to the pedestal sink and toilet and your lovely round mirror! What a transformation, and that tiny mirror in your “before” shot, maybe I need one of those to make me feel skinny! You better go check out my winners list, because you are on it. Love it! 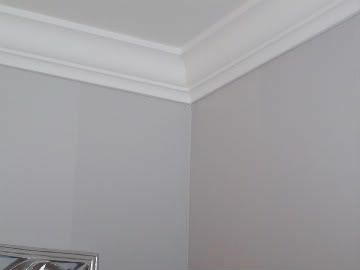 I painted over wallpaper in my 1st house…..took down border in my 2nd house, and was soooo happy to not have wallpaper or border to deal with in my 3rd house. I’ve gone both ways…stripped the wallpaper and painted the wallpaper. It CAN be done, as you so cleverly have shown. Love the stripes in flat and satin, I’ve seen them in designer rooms and yours looks great! I also just painted over wallpaper. Our painter didn’t want to do it at first but even he was surprised by how well it turned out. You seriously can’t see a seam. He used a rubber paint by Mautz. It isn’t anymore money but only comes in a flat finish. I was okay with that. … a small price to pay for not having to strip a foyer, stairwell and two hallways. I am in love with the grey you chose. It is really stunning. I had ugly wallpaper on one wall of our mst.bdrm. It was time to go. So I got out the spraybottle and fabric softner and away I went. I got it off, cleaned the wall up and painted. Well worth it, looks great.